After several years of disappointing holiday sales seasons (at least for brick and mortar retailers), industry analysts spent the weeks leading up to Black Friday establishing the narrative that this year would be different. Inspired by tax cuts, rising wages, low unemployment and, improbably enough, Trump's bellicose protectionism (according to some), US consumers would rack up more than $700 billion in purchases by Christmas. That would make this year's holiday shopping season the strongest since the boom years of the mid-2000s. Or at least that's what the National Retail Federation has been saying. But even with credit-card debt near all-time highs, it didn't shake expectations that consumers would reach deep into their pockets and splurge on what many fear could be the last boom year before the end of one of the longest business cycles in history. And when the headlines started rolling in Friday morning, they were universally positive. Online purchases surged nearly 30% yoy on Black Friday, and Amazon touted an increase of 20% on Cyber Monday, with sales in record territory for the entire weekend. Analysts also pointed out some notable shifts in how consumers shopped - for example, consumers' shopping on smartphones rivaled those using desktops. But for brick-and-mortar retailers, the picture was somewhat less rosy when compared with last year. And now that the final sales tallies are available, it appears the initial projections were a little too optimistic. Citing data from the NRF, Bloomberg reported that more than 165 million Americans shopped either in stores or online during the "Turkey Five" - the five-day period from Thanksgiving Day through Cyber Monday. And while that beat estimates for 164 million, it was 9 million below the 174 million who turned out last year. And while those who did shop spent an average of $313 per person, that too was down from last year's $335. Analysts were quick to point out that this isn't a sign of faltering spending; rather, consumer shopping habits are simply shifting. Fed up with ridiculous lines on Black Friday, more consumers are starting their shopping earlier. Sales are starting earlier, offering fewer incentives for consumers to subject themselves to the crowds (not to mention the perennial frenzy of violence). According to the NRF, consumers spent $20 billion between Nov. 1 and Thanksgiving - nearly $1 billion a day. And while Black Friday has typically been the biggest-spending day of the holiday season, this year, analysts anticipate that it will be eclipsed by the Saturday before Christmas. "Sales start earlier right after October, Halloween, and they continue right up to Christmas Day," Bill Thorne, NRF’s senior vice president of communications and public affairs, said on a conference call announcing the weekend’s results. "I think at the end of the day what we’re seeing is that Black Friday remains a traditional, if not emotional, start to the holiday season." These explanations sound plausible, of course. But those who count their chickens before they hatch risk tempting fate. 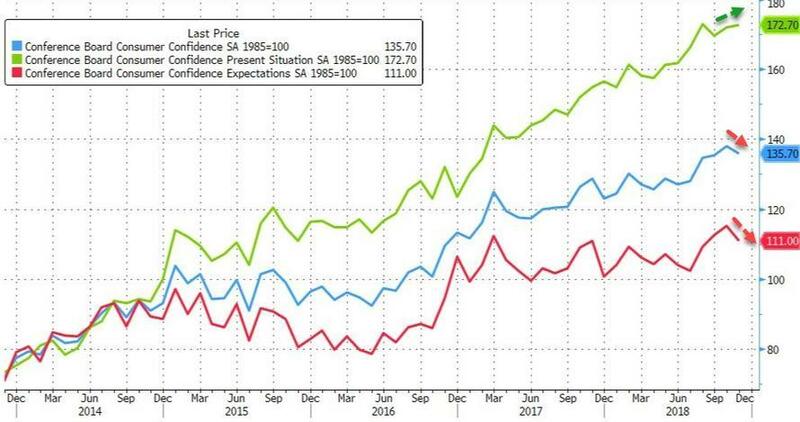 "Soft" data released Tuesday morning showed that while, consumer confidence remains high, expectations are starting to dip. 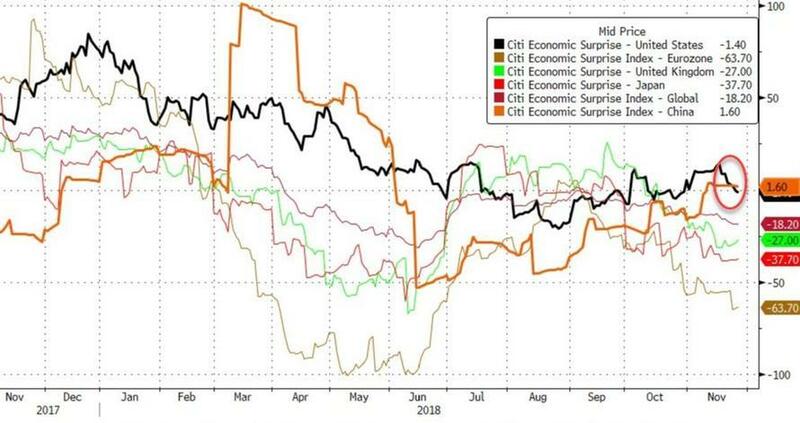 ...Citigroup's Macro Surprise Index shows that this is no longer the case.